How Strictly do Chicago Police Enforce Bike Traffic Laws? If you ride a bike, ask yourself: Do you stop at every stop sign? How about every red light? If the answer is no to either of those, well, technically you’re breaking the law. But it’s the more egregious behavior from cyclists — weaving through cars, cutting people off, running red lights despite oncoming traffic — which our questioner, Chicagoan Ron Lowy, sees all too often. Sometimes he’s even looked on as cyclists bike the wrong direction down a bike lane, no hands on the handlebars, while text messaging. “I’m not making this up,” he says. Getting an answer to Lowy’s question matters because, for one, Chicago streets are not as safe as they could be. A 2014 safety report found that Illinois had the fifth-highest number of bicyclist fatalities in the nation, a total of 29 in 2012, a steady increase from previous two years. 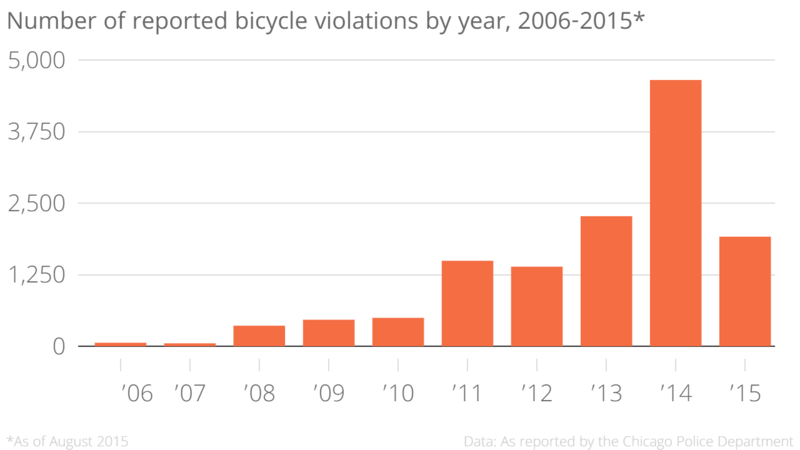 In Chicago, the number of deaths of bicyclists has surged in the past two years, from three in 2013 to eight in 2014. It’s a troubling shift the city’s transportation commissioner calls “significant.” If one aim of bike traffic law is to prevent dangerous behavior on the part of bicyclists, it’s fair to ask how often police nab offenders. But here’s another reason to consider how strictly the city enforces its bike rules: The city’s encouraging residents to ride bikes and even commute by bike. If those long-term plans pan out, Chicago could see more and more bicyclists on the road, competing with cars and pedestrians for space. First, some bad news. Ideallyspa, it would be best to answer Lowy’s question with precise figures about how many bicyclists are on Chicago streets, then follow with an apples-to-apples comparison of how often police ticket riders versus how often they ticket motorists. The data we have in hand can’t tell that story, but — and here’s the good news — we did obtain data on how often the city enforces bike traffic laws and what types of behavior attract tickets. What to make of this figure, though? 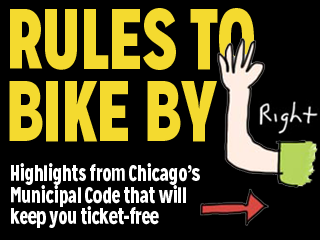 Have the thousands of tickets issued by the CPD translated into an awareness of bike traffic enforcement? To get a better sense of this, we head to Critical Mass, a monthly mass ride through downtown Chicago that doubles as a rally for greener modes of transport. There, we ask folks their impressions of bike laws and how the city enforces them. Among the crowd, we ask a cyclist named Lily whether she’d ever gotten a ticket on her bike. “No, you can get a ticket? I didn’t know you could get a ticket,” she says. 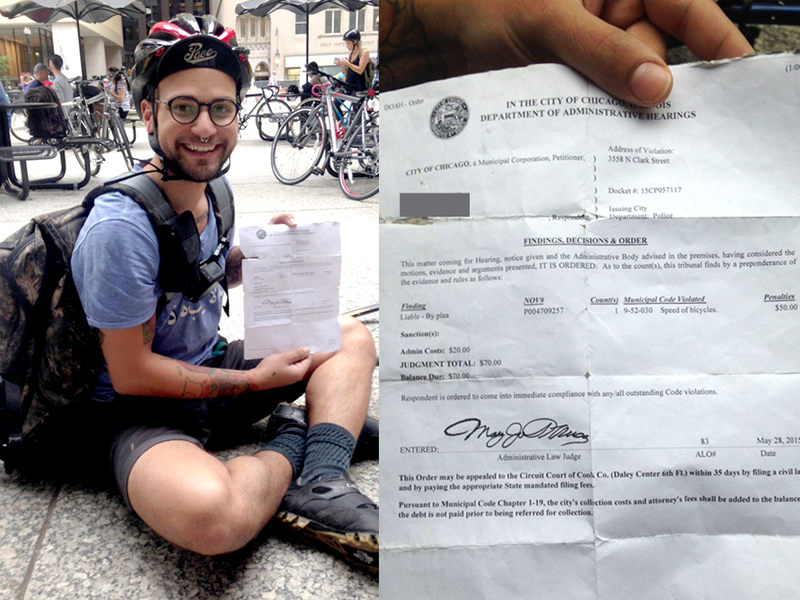 At the same Critical Mass event, we manage to find Michael Gilewicz, who got a $70 ticket at the intersection of Addison and Clark streets. The ticket is such a novelty to him that he carries it around, almost like a trophy. Whipping it out, he explains that he’d gotten pulled over for speeding, biking against the flow of traffic and disobeying red lights. Michael says when the judge read off the list of infractions, he looked at her and laughed. “Yeah, I was,” he laughs. The apparently low level of awareness of tickets or ticketing comes as no surprise to Ron Burke, the executive director of the Active Transportation Alliance, a local organization advocating for better biking, walking and transit. Burke says that while well over 90 percent of traffic injuries and fatalities are caused by motorists, bike behavior factors in, too. It’s important, he says, that we encourage good behavior across the board. And that, he adds, is done by enforcing the road rules and issuing hefty fines for those who don’t follow them. When city police enforce bike laws, what are they targeting? In Illinois, traffic laws apply to cyclists, so when CPD targets cyclists, it&apos;s for those state statutes as well as city ordinances that apply to bikes. Within the 9 years of CPD data available to us, the most frequent violation is 9-52-020, “Riding bicycles on sidewalks and certain roadways.” (The ordinance covers riding on certain non-bikeable roads like Lake Shore Drive, but the vast majority of infractions involve sidewalks). Similar data obtained from Chicago’s Department of Administrative Hearings show that over the past year, tickets for riding on the sidewalk are way up. In fact, between 2013 and 2014 sidewalk-riding violations more than doubled, to 4,467 from 2,082. Burke says that while enforcement is lacking everywhere, when cyclists do get ticketed it’s usually the riders who are doing the most dangerous types of riding. In recent years, as the number for cyclists rise, Chicago and other cities around the country have started to ticket more frequently. The Chicago Department of Transportation and city police have been conducting stakeouts around the city, targeting intersections with high crash rates. There, they crack down on risky behavior of bicyclists and motorists. CDOT and the police are conducting more and more of these safety stakeouts. According to CDOT data, they’ve already hit a record so far this year: 126 stakeouts, with more than 2,000 warnings given to cyclists. The first year the city began recording the events, in 2011, they conducted just 62 such stakeouts. Incidentally, some Chicago-area suburbs are seeing the same trend in enforcement. Several North Shore communities have also started cracking down on group cycling. This summer, from late July and into August, the Highland Park Police Department joined forces with four other city police departments to conduct enforcement and education stops for cyclists and motorists. The action came after the departments received numerous citizen complaints about cyclists’ behavior along several well-traveled North Shore paths. As Chicago ramps up its bike enforcement, it’s also encouraging more residents to bike. It’s busy building a better cycling infrastructure with two-way bike lanes with their own traffic lights. It also launched the bike sharing program, Divvy, and placed bike borrowing stations across the city. Still, all this momentum raises the question: If the city is investing so much in a better biking culture, shouldn’t it be even more explicit and consistent about what type of behavior it expects from cyclists? Burke says it should and he credits the city for conducting the high-profile stakeouts. He says he’s impressed with how much the city has increased them while at the same time including the ATA and their Bike Ambassador program in the stakeouts. This approach, he says, makes these enforcement actions educational as well. But Burke also predicts that over time, more and more cyclists will follow the rules of the road. He chalks it up to “pack mentality.” As more people bike, they are more likely to comply with common sense safety and less likely to be influenced by the few rogue cyclists who choose to ignore the law. “You get more people on bikes. You actually start to get better behavior on average of cyclists,” Burke says. What’s more, data suggest that better biking infrastructure also builds more complaint riders. 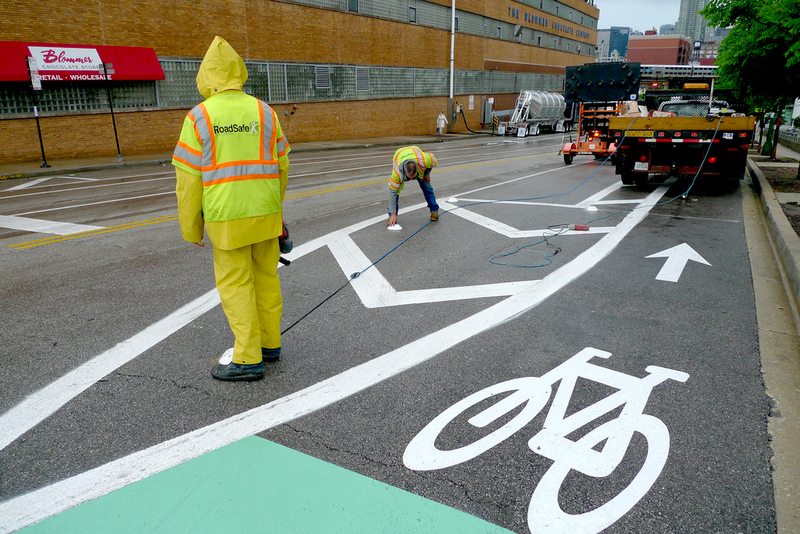 Just six months after the city built the two-way protected bike lanes on Dearborn Street, complete with their own traffic signals, compliance with red light traffic laws was up 161 percent, according to the city. Our questioner, Ron Lowy, says he thinks despite the shiny new bike lanes, some folks will always choose to break the law. That is, until Chicago takes a stand. A self-described “man about town dude”, Ron Lowy is a musician, cab driver and bicycle advocate. Lowy agrees with the ATA’s Ron Burke; more enforcement would make cyclists, pedestrians and motorists safer. But he is also more nuanced about whether bikes and cars should be treated as equals—subject to all of the same rules of the road. “Depending on the situation, bikes are a different story than cars,” Lowy says. He believes crowded and highly trafficked thoroughfares should be tightly enforced. But side streets, during off peak hours when there is little traffic, not so much. Meribah Knight is a freelance journalist in Chicago and reports for WBEZ’s Curious City. Follow her at meribahknight.com and on Twitter at @meribah. Curious City intern John Fecile provided research and reporting for this story.